The September Beauteque BB Bag came really late; they only shipped it out on 25th September, after I’ve sent an email chasing them for it. I don’t understand how they have so much time to keep sending mailers with spoilers for the box, but fail to send out boxes on time. I don’t want to receive my September box in October, and I don’t want to see spoilers without getting my box. They need to get their priorities right. 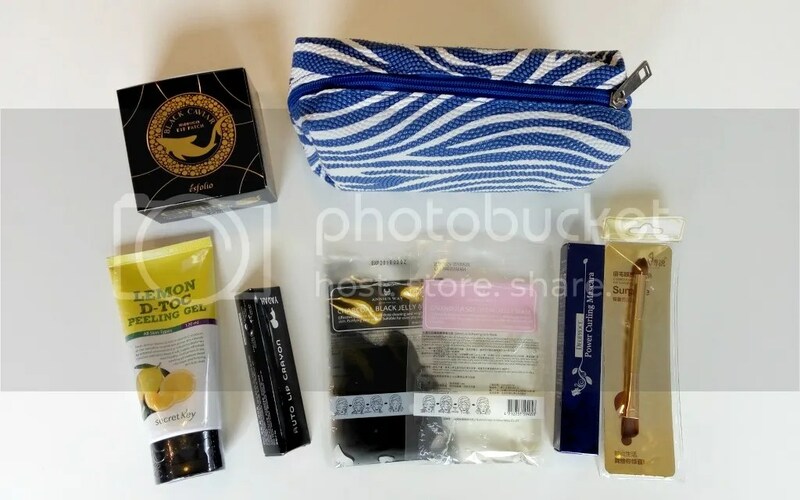 Beauteque BB Bag claims to deliver Korean beauty to your door monthly and it includes skincare, makeup, body care, and more. The subscription costs US$24/month; I had a discount code so I bought a 3-month subscription for US$64.80, plus another whopping US$26.85 for total shipping costs to Belgium. That brings each box to US$30.55 for me. The bag comes with a really pretty makeup bag this month – in a scaled blue and white design; I really like it and will be using it to keep my stationery instead. It’s very big and roomy so it’s perfect to house the huge amount of stationery that I love carrying around. These hydrogel eye patches seem to be catching on recent years; the last time I went to Korea there were loads being sold. These are quite convenient and I will be using them. This is meant to be used dry; when the gel is rubbed against the skin, small little beads form – they’re supposed to be dead skin cells. I think it’s gimmicky but I have used a few of these before and somehow I feel my skin is smoother after use. Plus it’s quite amusing. This is actually a bright orange colour, rather than the rose beige that I was expecting. It’s quite pretty, but not really in line with the current season. These look interesting – they’re jelly in texture. I’m really quite interested to try these out. These are not Korean products though – they’re made in Taiwan. I’m not opening this mascara yet as I don’t want to spoil it, but it’s supposed to have a half-moon shaped wand to reach even the smallest lashes. This has come at a good time – I’m about to throw out the current mascaras that I’m using so I need replacements. A dual-ended eye brush; I don’t like brushes like this as I like to stand my brushes upright and this makes me confused about how I should stick my brushes in. If you’re reading this, a little hint that a giveaway is coming up soon so this will be in it. I’m actually rather happy with this month’s bag – the eye patch and peeling gel will come in useful, and the jelly masks look interesting to try. I’m not that excited about the lip crayon or mascara but they are usable. I also really like the beauty bag that came with it. However, I won’t be renewing my subscription after my 3-month subscription ends in a month. I don’t like how tardy they are in sending the boxes out, and I don’t like how they claim to be a korean beauty bag but yet the bags contain so many Taiwan and Chinese products. They’re not a good korean beauty subscription bag – the korean products are from very obscure brands that you can barely find in Korea. Without the discount that I had the first time, the subscription is quite expensive when factoring in the shipping costs. So, what do you think of this month’s Beauteque BB Bag? I agree on the color of the lip crayon. Says rose beige but it’s really very orange. Not a good color for me. I’m not sure I would really call the jelly masks ‘masks’ per se. They didn’t peel off at all, but I was pleased with the results after I washed the dried stuff off. The black caviar eye patches are awesome.